Keith began his career at AAA Small Car World. Under his father’s (Ron Sturgeon) guidance he worked there for eight years. In 1989 while a junior in high school, Keith opened All Import Auto Parts. He would go to school in the morning while his mother ran the counter. Keith started with crushed cars that he purchased from Paul Parker’s yard, First Choice Auto in Dallas. Throughout the years, Keith has been a dismantler, parts puller, buyer and salesperson. Tammy grew up in the industry spending 10 years managing her father’s recycling facility. In 1994 Tammy married her competitor and joined All Import Auto Parts. All Import Auto Parts grew up on old school principles, offering quality used auto parts, competitive prices and great customer service. Their mission is to treat the customers with old school courtesy using 21st century computerized inventory. 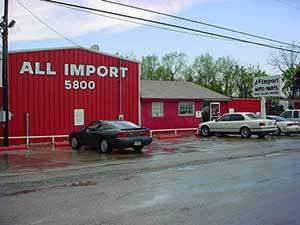 All Import Auto Parts has 5,000,000 Foreign and Domestic parts at their fingertips. If you can’t find a part using the used auto parts search, just call or email and one of the sales team will help you.